A three day, on-site welcome orientation that covers academic issues, information about course registration, health and safety, culture shock, information about host families, cultural information, and an introduction to public transportation and other practical information. All students receive a program manual, which contains a wealth of information about the program, the city and the country. As part of the GW Madrid program, the Resident Director organizes at least two 3-day excursions and several cultural activities in Madrid and the surrounding areas, all included in the cost of the program. 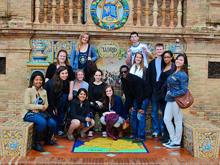 In past years fall semester students have traveled to Toledo, Salamanca and Andalucía, and spring semester students have visited Segovia, Andalucía and the Basque Country, which includes Rioja, Bilbao, San Sebastián and Pamplona. In Pamplona students visit the site of the running of the bulls, one of Earnest Hemingway’s favorite pastimes in Spain. During both semesters, trips are organized to El Escorial and Barcelona, and a burro (donkey riding) excursion in the Sierra near Madrid is offered as well, allowing students the chance to learn more about the distinct regions of Spain. 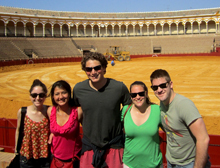 Additional activities included in the program fee for students in Madrid include language exchanges with UAM students, outings to see classical theater, ballet, and flamenco performances, Spanish film screenings, soccer games, and going to see a bullfight. "Everyone should go to every single one of the excursions that are planned - they are always rewarding, and they're usually free! There are lots of trips within Madrid to the theater for flamenco, ballet, and plays, in addition to the excursions outside of the city. Our trip to Barcelona was one of the highlights of my trip so far. And don't be weirded out by the donkey ride excursion - it was fantastic!!" "I would definitely recommend participating on the program excursions because they help you learn about the Spanish culture. I enjoyed all of our activities, many of which are things you can't easily get in the U.S. (such as flamenco dancing, Spanish theater, Spanish films, and the amazing museums in Madrid such as the Prado)."